Choose a news article from the list below. 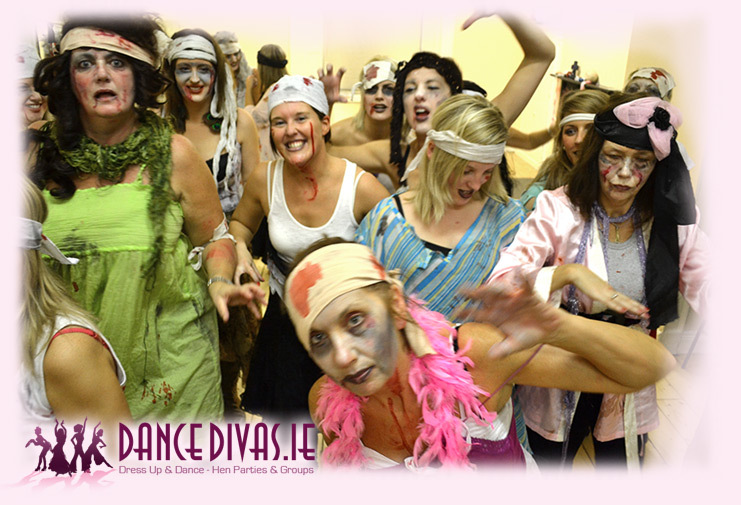 Why not try a Dance Divas - Dress Up & Dance Package for your Team Building Event? Due to a cancellation for Galway City, Dance Divas is available for Hen /Sten Booking in Westport / Ennis / Athlone or anywhere in the West of Ireland on the 12th of May 2018. Why not consider joining forces for your upcoming pre-nuptial celebrations? It’s the perfect way for a couple to save money and still have a party. And a Combined party will mean a larger group, which means more people to keep entertained. Also many of the guests from each side may not know each other. A Dress Up & Dance class from Dance Divas may be just the activity to suit your Sten Party. Several of the packages on offer are suitable for mixed groups. Dressing up in costume and dancing is a great way for a group to break the ice and get to know each other. A photoshoot of the entire group in costume is also included with each activity. So check out Dance Divas mixed group photo gallery and contact me for further information. Do you want to be a Dancing Queen? As with all Dance Divas packages costumes and and photo shoot are part of the package. Since introducing Dirty Dancing to the list of dance packages on offer with Dance Divas - Dress Up & Dance, it has quickly beocome the most popular dance class on offer.